Follow @mcphoo Tweet I am directionally impaired. If someone asks "do you remember if we go right or left?" and i say "left" do yourself a favour and go right. Likewise when i was trying to learn about muscle action it took me ages to unpack flexion and extension from eccentric and concentric contraction. So for any of you folks out there trying to understand what a negative contraction in flexion might look like or if an eccentric contraction can be positive and in extension, this post is for you. 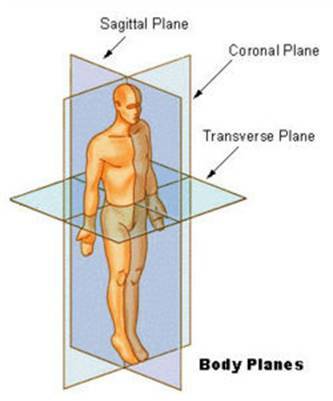 Just to start of orienteering, most stuff in kinesiology seems to refer to the midline of the body, and the body is trisected into three planes: sagittal, frontal (coronal in the image) and transverse. These terms simply make it easier to talk about direction of a move. Eg a forward bend is mainly an action in the sagittal plane. A lateral raise is in the frontal. 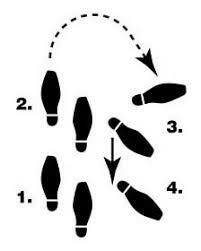 One might then say ok, what of your moves is working transverse? This is a big deal as transverse is associated with rotation and rotational power is important. internal/external rotation. oy.But i digress. The main thing is that there's a midline of the body. We'll see that in action. To hold something, muscles contract. That's it. The interesting thing is that muscles can contract in different states - usually one of three states. 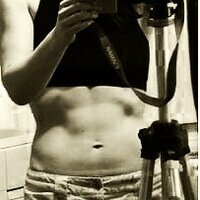 Isometric - a contraction is happening without any muscle lengthening/shortening. 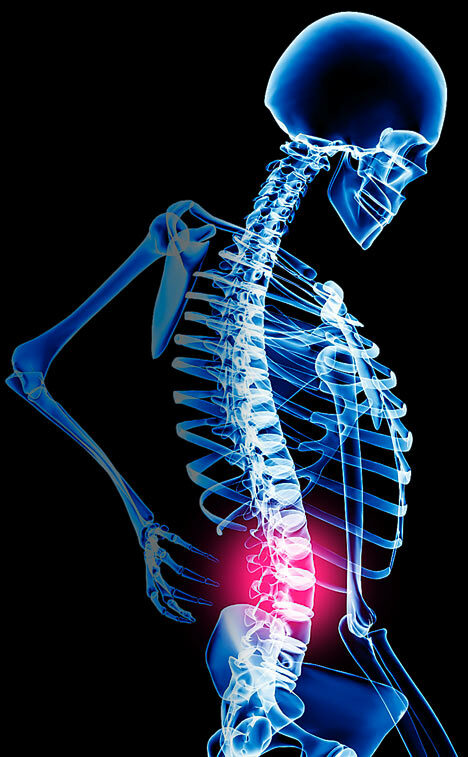 Joints have a lot of ways of being described as moving: rotation, elevation and depression; adduction (towards the midline, latin ad, to, towards), abduction (away from the midline - latin ab, from), and the more familiar extension and flexion. To these can also be applied anterior, posterior, medial and lateral. Or front, back, towards the middle towards the outside (where the body is the reference point). Let's look at just the two most commonly discussed terms in the workout room, flexion and extension. Extension, generally, is increasing the angle in a joint. So standing up from a squat is both knee and hip extension. Flexion, by contrast, is decreasing the angle in a joint. So the top of biceps curl is flexion around the elbow joint. Another name for Eccentric contraction is a Negative. And concentric is a Positive. Why they're called that, i dunno. I'm guessing that that's because the challenge is often perceived to be in the lift, and we move something from a starting position to a finished position, and going from a finish to a start is seen as the flip side or negative. I prefer eccentric/concentric because of the different types of effects due to different types of actions. We're stronger in the negative phase of a move - consider how much easier it is to lower a piano than to lift one. Interestingly eccentric contractions are less well understood than concentric contractions, but what we do know is that eccentric contractions are strongly correlated with DOMS - delayed on set muscle soreness (more on DOMS here). So now we have a rough vocabulary for muscle and joint action. Let's try a couple of descriptions. In a march or sprint step practice, when the knee comes up this is an example of hip flexion as the angle at the hip socket is narrowed via the femur coming towards the pelvis. The aptly named hip flexors group of muscles will be contracting to make this move possible - to pull the joint angle together. If the knee is likewise bent as in a marching step, there's knee flexion too. 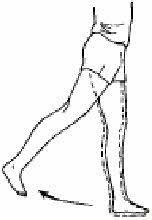 If the knee straightens out, however, as in a kick, we have knee extension with hip flexion. In this case, the knees are being pulled into extension by the quads concentrically contracting, too. Kick that straightened leg all the way back - like the tail end of a sprint stride, and there's hip extension - where the hamstrings and glute actually contract to keep the leg from flying off in a sprint. To see eccentric contraction, we can look at the ever popular biceps curl with flexion around the elbow. As we lower a weight, we are working against resistance, letting the joint angle increase to lower that object under control. So we could now do an anterior lunge - moving the lunging leg to the front. And we'd know that the anterior lunge foregrounds knee flexion - the hamstrings and related flexors concentrically contracting to shorten and so pull the tibula/fibula towards the femor. We could talk about anterior and posterior glides of the head where we affect a "chicken neck" to move the cervical spine past the front midline of the body and then pull it in the opposite direction towards behind the midline of the body. So we have eccentric and concentric contractions, negatives and positives being the same; flexion and extension and some directions - and the midlines of the body.